Ambient wizard Shane Morris returns triumphantly to Earth Mantra, with a brand new studio release called Equinox. Folks, we have a serious treat in store for you with this one. Fans of Earth Mantra will know Shane from his transcendent live releases Premonition and Magnetosphere, as well as his live collaboration with Dan Minoza entitled The Ritual Space. This time Shane delivers a collection of composed pieces realized wholly within his studio - and knocks the ball completely out of the park. We at Earth Mantra love to listen to so-called tribal ambience, the kind of music that combines powerful hand percussion with mysterious and evocative textures, yielding profound otherworldly soundscapes. When tribal ambience fuses with space music, a particularly potent blend emerges, exactly the kind of music that can be found on this delicious release, a disc that lovers of the Steve Roach or even Vidna Obmana schools will feel completely at home with. The compositions on Equinox simply mesmerize. We listen to a lot of ambient music, but something about this album captures our imagination in a way few others do. Perhaps Shane's immaculate percussion work is the reason, or maybe it is his remarkable ability to layer complex sounds without the sound ever becoming overburdened. Certainly, Shane's live performance chops have reached their pinnacle of expression with Equinox. This is the album Shane was born to make. For we are simply blown away by the sheer perfection of this extraordinary release. It is very difficult to pull off a tribal ambient collection that really hits on all cylinders, where the percussion feels effortless and the slow-evolving ambience blends perfectly with the fast-moving drum lines. And yet, Shane makes it all seem easy, propelling wave after wave of gorgeous ambient delight through our speakers, with a truly professional sheen. And the tasteful guitar and didgeridoo work contributed by Dan Minoza and AK Blake are the frosting on the cake. 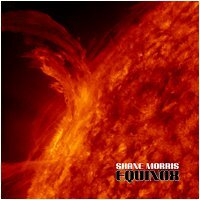 So it is with great pride that we unveil to our listeners Equinox, the latest album by Shane Morris. A masterwork, and certainly one of the top releases of 2011 so far. Brilliant and perfectly executed. Fantastic Fantastic stuff!! This album's going on my ipod for hikes in the desert. Awesome Shane. So good to hear you and AK playing together! I feel like this album has been brewing in your brain since we met. Fabulous. Lovely and amazing. Carried me right along as I listened. This is music to live by. Magic Sound! I love it! Quality stuff! Professional-grade tribal ambient.